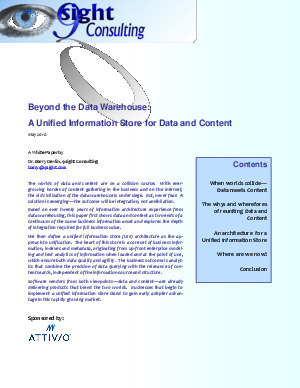 With the explosion of unstructured content, the data warehouse is under siege. In this paper, Dr. Barry Devlin discusses data and content as two ends of a continuum, and explores the depth of integration required for meaningful business value. He explains how a unified information store can provide the platform for deeper insight and examination by bringing together data and content from diverse sources, without disrupting the integrity of the information as it is stored.